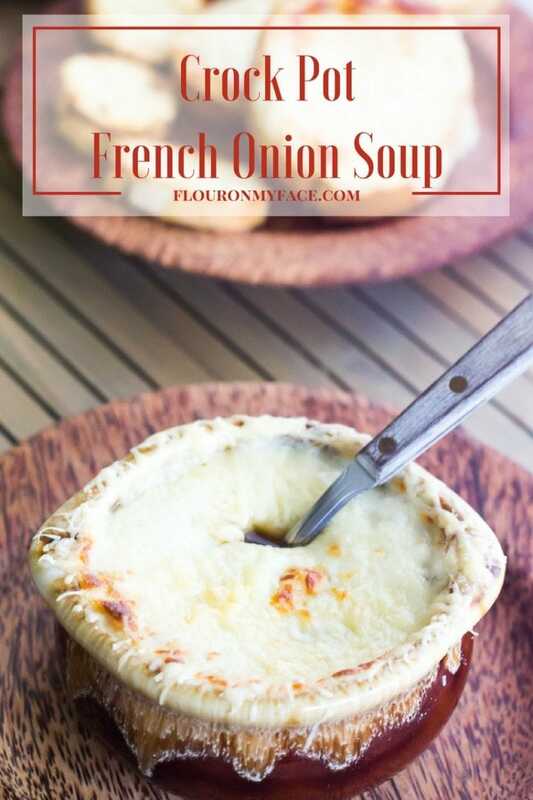 This Crock Pot French Onion Soup recipe an easy crock pot soup recipes that takes all the work out of caramelizing onions. I’ve made French Onion Soup before. One of the hardest parts of making French Onion soup is caramelizing the onions. When you use your crock pot to do all the hard work for you the onions are easy to caramelize. 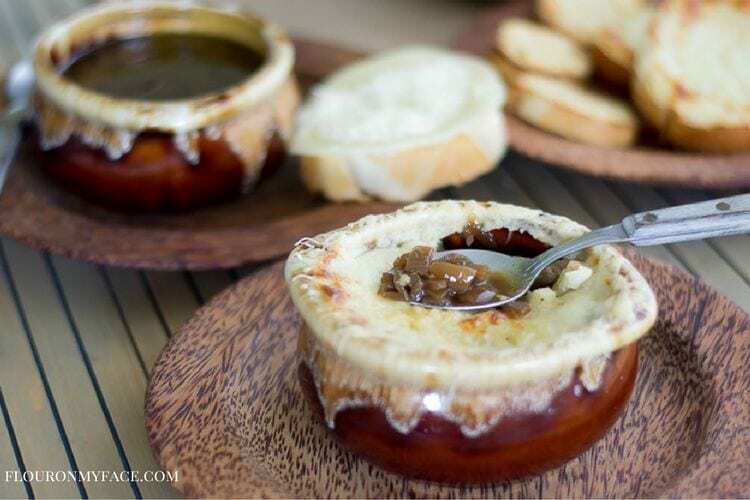 This Crock Pot French Onion Soup recipe is perfect for the cooler Fall temperatures that are probably starting to show up in your neck of the woods. Down here in Florida we are still hitting the 90’s. UGH! I know I must be starting to sound like a broken record but I am so sick of the heat. This has been one of the hottest summers I can remember and I have lived here for over 23 years. 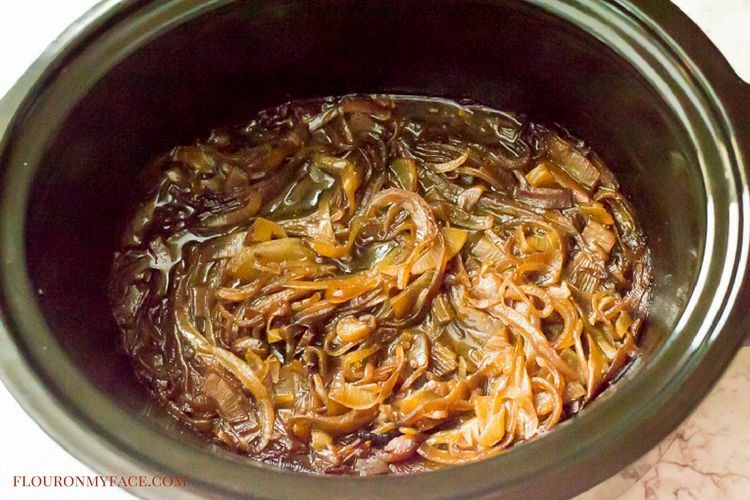 Can you caramelize onions in a crock pot slow cooker? Yes, you can! You may have thought that you could never make French Onion Soup in a crock pot because you couldn’t imagine caramelizing the onions in a slow cooker. It is very easy to get the sliced onion golden brown and tender. Cooking them slow and low in a crock pot takes all the work out of making caramelized onions! No more standing over the stove tossing those onion slices all over the place when you use a crock pot. What kind of Cheese to top French Onion Soup? A traditional French Onion Soup is topped with a toasty piece of French bread and a slice of Gruyere cheese. The last time I made French Onion Soup I had a hard time finding sliced Gruyere cheese. For this crock pot French Onion Soup recipe I used a slice of provolone cheese and finely grated fresh Parmesan cheese. It was delicious and I will never run around town looking for sliced Gruyere cheese again. I also made some mini Parmesan toast to go along with the slow cooker French Onion soup. You can’t have too much cheesy bread for dipping in a good bowl of soup as far as I am concerned! Because a crock pot cooks low and slow there is an extended cooking time to get those onions caramelized and tender. The night before serving the French Onion soup I started the onions in the crock pot at about 11 pm. I cooked the onions on low overnight. At about 8 am the next morning I started the next phase. I increased the heat to high after adding the beef broth then cooked for 2 hours on high and then 2 hours on low. This worked perfectly for me for lunch and because I have to take photos when I have sunlight available I needed to serve this soup before dinner time. 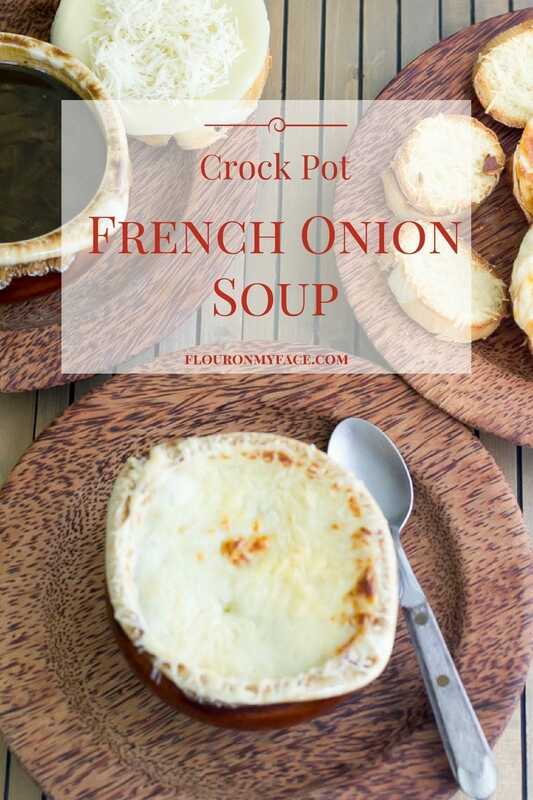 If you’d like to cook this French Onion soup until dinner time leave the crock pot set to low and continue cooking all day. Or if your crock pot has the warming setting you could cook it for 8 hours on low and turn the crock pot on warm until dinner is served. The recipe is very forgiving. If you think too much liquid is evaporating you can add another 1/2 cup to 1 cup of beef broth. The longer this French Onion soup cooks the richer the broth will become. I also added about 1/2 cup of grated Parmesan cheese to the serving bowl of soup. It adds a nice flavor but you can skip that step if you like. Place the first 7 ingredients into a 6 quart crock pot. Cook on low for 8-9 hours overnight or until the onions are dark and caramelized. Next add the beef broth and thyme to the crock pot. Increase the temperature to high and cook for 2 hours or until simmering. Reduce the heat to low and cook an addition 2 hours. Before serving ladle soup into individual oven safe soup crocks. Place a slice of toasted French bread on top of each crock, place a slice of cheese on top of the bread. Sprinkle the top of the cheese slice with the Parmesan cheese. Melt the cheese under the broiler until golden brown. I’ve made French Onion Soup before. One of the hardest parts of making French Onion soup is caramelizing the onions. When you use your crock pot slow cooker to do all the hard work for you the onions are easy to caramelize. 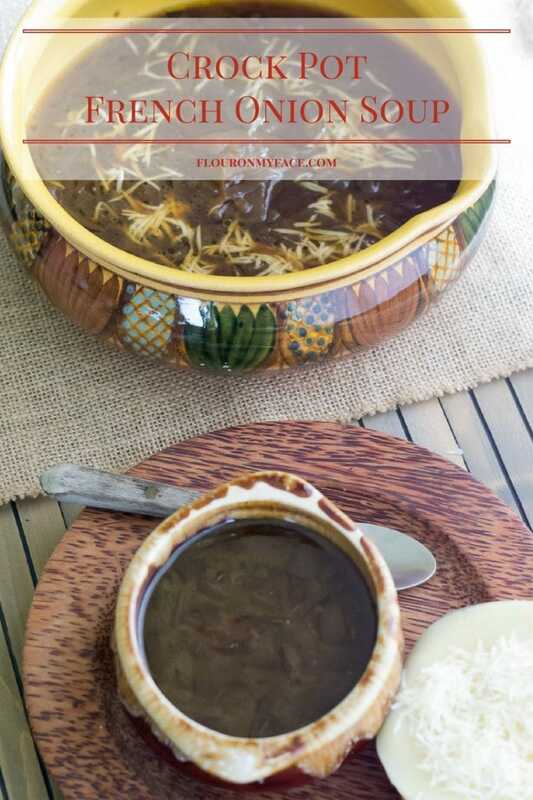 Looking for more crock pot soup recipes like this Crock Pot French Onion Soup recipe? 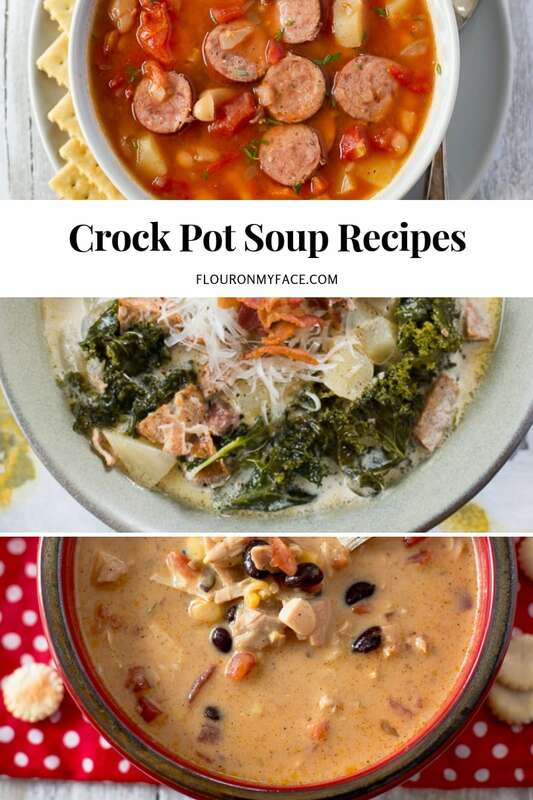 Head over to the crock pot soup recipe page where you will find all my crock pot soup recipes. You can find all my other crock pot recipes on the crock pot recipes page. One of my favorite soups now made easier! Enjoy the recipe! It is so much easier made in a slow cooker!